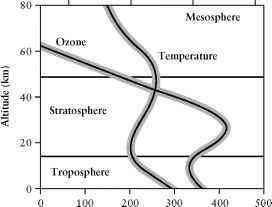 Reaction (5-29) is the exclusive source of ozone in the stratosphere and mesosphere (as well as being the only source of ozone in the troposphere, although the source of O atoms is different: see Sections 5.3.2 and 5.3.3), and sO and O3 are often referred to as "odd oxygen," Ox is a major source of destruction of O atoms.9 Despite its small concentration (it does not exceed 10ppm anywhere in the atmosphere), ozone is one of the atmosphere's most important and remarkable minor constituents. It is found throughout the atmosphere, but particularly in the stratosphere in a well-defined layer between 15 and 30 km altitude. Since its production depends on the photodissociation of molecular oxygen by the sun, it is produced primarily in the stratosphere near the equator and transported toward the Arctic and Antarctic poles.10 As pointed out in Chapters 2 and 3, not only does it provide the shield for the earth against damaging ultraviolet radiation, but also, through absorption of this radiation, it becomes the main energy reservoir in the upper atmosphere, hence a factor in climatic regulation. On the other hand, ozone is one of the most toxic inorganic chemicals known, and its presence at relatively high concentrations in lower atmosphere polluted air makes it a potentially dangerous substance for humans and other organisms. The wavelength of maximum absorption in the visible is 600 nm, CTmax ^ 5.6 x 10"21 cm2/molecule. 9It has been proposed that the reaction between a highly vibrationally excited ground-state oxygen molecule and another ground-state O2 molecule, and/or the reaction of a vibrationally and electronically excited 3Sg oxygen molecule with a ground- state oxygen molecule, may also lead to the production of atmospheric ozone. See T. G. Slanger, Energetic molecular oxygen in the atmosphere, Science, 265, 1817-1818 (1994). 10However, the ozone concentrations are about twice as large at the poles as at the equator because, until recently—see Section 5.2.3.2—there were very few ozone-destroying reactions occurring at the poles. FIGURE 5-3 UV-C absorption spectrum of ozone at 298 K. Drawn from data of L. T. Molina and M. J. Molina, J. Geophys. Res., 91, 14,501-14,508 (1986). 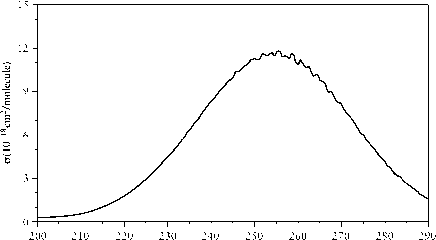 FIGURE 5-4 UV-B absorption spectrum of ozone at 298 K. Drawn from data of L. T. Molina and M.J. Molina, J. Geophys. Res., 91, 14,501-14,508 (1986). This represents direct conversion of solar energy to thermal energy and leads to stratospheric heating. A tremendous amount of solar energy is involved: the average rate of energy conversion for the whole earth is greater than 2 x 1010kj/s (kW), which is over three times the total human rate of energy use. The importance of the O(1D2)—producing reactions above 310nm given in footnote 11—is emphasized by the roughly threefold increase in solar intensity at sea level between 310 and 330nm (Figure 3-4). Atmospheric reactions involving O(1D2) atoms and the hydroxyl radical are covered in following sections. FIGURE 5-5 Atmospheric temperature and ozone concentration profiles. Note that the ozone concentration axis is logarithmic. 13That is, a "quasi-equilibrium," where the ratio of component concentrations is maintained constant as long as the light intensity is constant, giving the appearance of an equilibrium. that stratospheric ozone is also affected by reactions involving species other than the three oxygen allotropes, even though these other species are present only in trace amounts, whereas huge quantities of ozone are produced and destroyed daily by the four reactions constituting the Chapman cycle. These reactions are discussed next. It has been pointed out before that the ozone layer is involved in stratospheric heating and control of the earth's climate, and in shielding the biosphere (the surface of the earth) from potentially dangerous near-ultraviolet radiation. In general, the lower the wavelength, and thus the higher the photon energy, the greater the direct biological damage. Exposure to solar radiation greater than 320 nm (the UV-A spectral region: see Section 4.2.2) at the earth's surface is not considered to be dangerous because DNA does not absorb above 320 nm. Radiation in the UV-C (200-290 nm) region is very damaging, but as we can see in Figure 5-3, ozone is a strong absorber in this region, and its concentration in the stratosphere is so high that virtually no UV-C radiation reaches the earth's surface. The critical region, then, is between 290 and 320 nm, the UV-B region, where the ozone absorption cross section is so low (Figure 5-4) that radiation is partially transmitted to the biosphere, and therefore the amount transmitted will vary with the ozone concentration. A general estimate is that a 1% decrease in the ozone concentration would lead to a 1.3% increase in UV-B radiation, although this is sensitive to the fraction of light transmitted, hence to the wavelength of the radiation. For example, at 290 nm a 1% decrease in ozone concentration would lead to a 10% increase in radiation at that wavelength, whereas at 320 nm the same decrease in ozone concentration would lead to only a 0.24% increase in radiation. It is important to note that the lower the wavelength, the more damaging is the radiation to DNA. Stratospheric ozone is maintained in a "clean'' atmosphere by the "quasi-equilibrium'' reaction (5-41), by transport between the troposphere and the stratosphere, and by variable stratospheric winds. The amount of ozone continuously produced and destroyed daily in the stratosphere is so large that any significant "nonnatural" overall destruction would require either an un-realistically large amount of ozone-destroying material or extremely efficient ozone-destroying reactions. In this section we consider several radical chain mechanisms or cycles in which the latter condition is met, thus suggesting that human activities could contribute (or have already contributed) to detectable modifications of the stratospheric ozone layer. in which the NO, called the chain carrier, leads to the destruction of O3 without being destroyed itself—that is, it is a catalyst. Therefore, one NO molecule can lead to the destruction of a very large number of O3 molecules before it is eventually destroyed itself by a chain-terminating step.14 The possibility that this NO-catalyzed destruction could possibly lead to a significant loss in stratospheric O3 was proposed in 1970.15 It is well known that jet aircraft, since they are air breathing, produce copious amounts of oxides of nitrogen, and it was projected at that time that a fleet of 500 transatlantic Concorde-type supersonic stratospheric transport (SST) aircraft flying routinely at an elevation of 28 km could reduce the ozone layer by the order of 5%. For a variety of reasons (economic, political, and the 1970s oil crises) by 2000 the anticipated number of SSTs had not materialized (although second-generation supersonic planes called high-speed civil transports, HSCTs, are being considered for the twenty-first century), and as of now stratospheric NO comes predominantly from tropospheric N2O (Section 5.2.1). 14Note that reaction (5-44) is the same as the uncatalyzed ozone-destroying reaction in a "clean" atmosphere, reaction (5-39). 15P. J. Crutzen, The influence of nitrogen oxides on the atmospheric ozone content, Q. J. R. Meteorol. Soc, 96, 320 (1970). where X is a reactive odd-electron (see footnote 2) species.16 For mechanism (5-45) to compete with the corresponding uncatalyzed reaction (5-39), and therefore to significantly lead to a reduction in stratospheric ozone, the two chain-propagating steps in the cycle must be very efficient. We see, for example, that the rate constants for these two steps in (5-44) at 298 K are 1.8 x 10"14 (5-42) and 9.5 x 10"12 (5-43) cm3 molecule-1 s"1, respectively, both larger than the value of 8.4 x 10"15 cm3 molecule"1 s"1 for the uncatalyzed reaction (5-39). The rates of the individual reactions will of course depend on the concentrations of the several reacting species, in this case NO, NO2, O3, and O, which are dependent in a complex manner on many atmospheric chemical and physical parameters. For example, since mechanism (5-45) involves O atoms, it would be expected to decrease in importance at lower altitudes where the three-body reaction (5-29) that consumes O atoms is significant. In general, mechanism (5-45) is considered to be significant only above approximately 30 km, even though the maximum ozone concentration in the atmosphere, depending on latitude, is between 15 and 25 km. 16For example, besides NO, X could be H, 'OH, Cl, Br, and so on. M. J. Molina and F. S. Rowland, Stratospheric sink for chlorofluoromethanes: Chlorine atomic-catalyzed destruction of ozone, Nature, 249, 810-812 (1974); F. S. Rowland and M. J. Molina, Chlorofluoromethanes in the environment, Rev. Geophys. Space Phys., 13, 1-35 (1975). Rowland and Molina, along with Crutzen (see footnote 15), shared the 1995 Nobel Prize in chemistry. 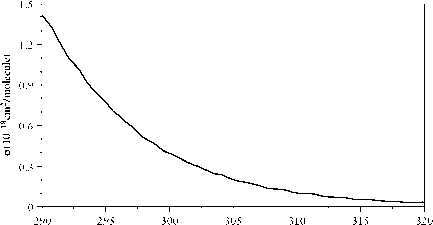 FIGURE 5-6 Absorption spectrum of CFC-12 (CF2CI2). Drawn from data of C. Hubrich, C. Zetzsch, and F. Stuhl, Ber. Bunsenges. Phys. Chem., 81, 437-442 (1977). 18See Table 3-2, note a, for a way of determining the formula of each gas from its number. 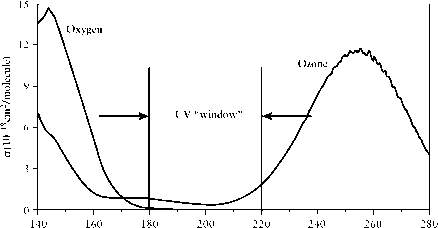 FIGURE 5-7 Solar UV window between oxygen and ozone absorption bands. Data for oxygen: 140-175 nm: M. Ackerman, in Mesospheric Models and Related Experiments, G. Fiocco, ed., D. Reidel, Dordrecht, 1971, pp. 149-159.175-195 nm: K. Watanabe, E. C. Y. Inn, and M. Zelikoff, J. Chem. Phys., 21, 1026-1030 (1953). Data for ozone: A < 185 nm: M. Ackerman, in Mesospheric Models and Related Experiments, G. Fiocco, ed., D. Reidel, Dordecht, 1971, pp. 149-159. A > 185 nm: L. T. Molina and M. J. Molina, J. Geophys. Res., 91, 14,501-14,508 (1986). Note that mechanisms (5-49) and (5-51) do not invo've atomic oxygen and therefore can occur at 'ower a'titudes than (5-48) and (5-50). This is important in the massive destruction of stratospheric ozone over the earth's po'es, discussed in Sections 5.2.3.3 and 5.2.3.4, as we'' as the important fact that HOC' and C'ONO2 serve as "reservoir'' mo'ecu'es in mechanisms (5-49) and (5-51), respective'y, for the reactive C' and C'O. species. recent estimates put the contribution of methyl chloride from biomass burning to the total amount of stratospheric chlorine at about 5%. Active volcanoes can discharge HCl (and, to a lesser extent, HF) into the lower atmosphere. However, in the troposphere volcanic HCl rapidly dissolves in water (which is in large excess) after it has condensed to a supercooled liquid, so that for the most part the HCl is washed out by rain with only about 0.01% of that emitted possibly getting to the stratosphere. Furthermore, the concentrations of HCl and HF would be expected to decrease with increasing height in the stratosphere if from volcanic sources; in fact, it is found that they actually increase at stratospheric altitudes20 where concentrations of CFCs simultaneously decrease because they are in the process of photodecomposition. Of course, volcanoes undergoing very violent reactions do have the potential to deposit large quantities of HCl directly into the stratosphere, which bypasses washing out by rain. A very significant factor indicating that such large volcanic activity is not a major contributor to stratospheric chlorine is the series of global measurements that have been made since 1978 on the accumulation of HCl in the stratosphere. During that time there have been two major volcanic eruptions: El Chichón in Mexico in April 1982, and Mount Pinatubo the Philippines in June, 1991, with the former releasing about 1.8 megatons (1 megaton = 1012 g) and the latter 4.5 megatons of HCl into the atmosphere. In spite of these, stratospheric HCl has increased regularly with only a small (<10%) increase after the eruption in Mexico and even smaller after the eruption in the Philippines. 20For example, at the equator the concentration of HF increases from zero at 16 km to > 1.0 ppb above 50 km. 21Volcanic eruptions can also temporarily affect the earth's climate; see Section 3.3.4. 22Even in the absence of volcanic activity, SO2 is present in the stratosphere from oxidation of reduced compounds of sulfur from natural and/or anthropogenic sources (such as carbonyl sulfide, COS, which is sufficiently stable in the troposphere to reach the stratosphere). stratosphere for years. Enhanced heterogeneous chlorine-catalyzed, ozone-depleting reactions can take place on these aerosols, as discussed in the next section in conjunction with the Antarctic ozone hole. It has been found, in fact, that stratospheric ozone depletion is enhanced after large volcanic activity, such as Mount Pinatubo, by these surface reactions, but not by ejected HCl. The volcanic debris also absorbs sunlight (e.g., the sunlight was attenuated between 15 and 20% at several Northern Hemisphere measuring sites at the peak of the effect following the Mount Pinatubo eruption), increasing the temperature of parts of the stratosphere and possibly altering the high-altitude winds that circulate tropical ozone around the globe. 23Halons are designated as H-wxyz, where w, x, y, and z are the number of carbon, fluorine, chlorine, and bromine atoms, respectively. Thus, CF3Br is H-1301, and CF2BrCl is H-1211. 24However most of these are deliberately set and thus are anthropogenic in origin. It is estimated that at the time of writing approximately 25% of the global stratospheric ozone destruction is caused by bromine. The depletion of ozone by a halogen-containing hydrocarbon depends on several factors, including the rate at which the hydrocarbon enters the atmosphere and its lifetime in the atmosphere (i.e., the time required for a given amount of a substance emitted "instantaneously" into the atmosphere to decay to 1/e of its initial value). The atmospheric lifetimes of fully fluorinated (per-fluoro) gaseous compounds are very long (many centuries), since their loss results primarily from photolysis in the mesosphere, where pressures are very low and mixing with lower-altitude gases is extremely slow. Partial chlorination (CFCs) or bromination (halons) shortens the lifetime because of absorption and photolysis in the 180- to 220-nm UV window (Figure 5-7), as well as destruction by excited O (*D2) atom reactions, both processes occurring in the stratosphere. Replacing some of the halogens with hydrogen or incorporating unsaturation in the molecule further greatly shortens the atmospheric lifetime because of reactions, such as with the .OH radical, in the troposphere. Atmospheric lifetimes of several halogenated gases are given in Table 5-1. Source: Scientific Assessment of Ozone Depletion: 1994, World Meteorological Organization Global Ozone and Monitoring Project, Report No. 37, U. S. Department of Commerce (1995). Data for the hydrofluoroether HFE-7100 (C4F9OCH3—see Section 5.2.3.5) is from J. G. Owens, "Low GWP Alternatives to HFCs and PFCs," presented at the Joint IPCC/TEAP Expert Meeting on Options for the Limitations of Emissions of HFCs and PFCs, Energieonderzoek Centrum Nederland, Petten, The Netherlands, 1999.
selected CFCs, HCFCs, HFCs, and halons that together account for more than 95% of the organic chlorine and more than 85% of the organic bromine in the atmosphere in 1995.25 The very large ODPs for the halons are due primarily to the synergistic coupled BrO. and ClO. cycle, mechanism (5-55). 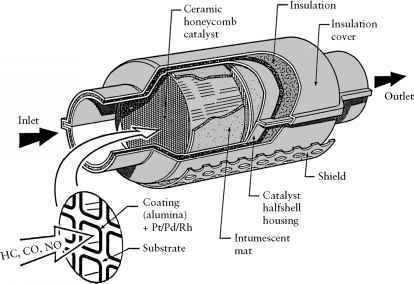 CFCs were first developed in 1930, and as pointed out earlier, until recently they (and the later developed halons) were used extensively in applications that could benefit from their inertness, volatility, and safety. It is estimated that approximately 90% of all the CFC-11 and CFC-12 produced to date has now been released into the troposphere. But has the release of CFCs and halons into the atmosphere already depleted the stratospheric ozone layer to a measurable extent? 25S. A. Montzka et al., Decline in the tropospheric abundance of halogen from halocarbons: Implications for stratospheric ozone depletion, Science, 272, 1318-1322 (1996). In addition, ozone concentrations from the earth's surface to heights as high as about 30 km have been measured by electrochemical concentration cell ozonesondes, carried aloft by balloons. Total global coverage of ozone has also been measured since 1978 from above the atmosphere by a variety of instruments aboard polar- and precess-orbiting satellites. For example, the total ozone mapping spectrometer (TOMS) measures the ozone attenuation of six UV emissions from the earth between 312 and 380 nm. A similar UV-scanning satellite instrument is the solar backscattered ultraviolet (SBUV or SBUV/2) spectrometer. The microwave limb sounder (MLS), aboard the Upper Atmospheric Research Satellite (UARS) launched in 1991, determines stratospheric ozone concentrations from its microwave thermal emission lines at frequencies 183 and 205 GHz (1GHz = 109s_1). Satellites have also been used to determine the vertical atmospheric ozone concentration in the Stratospheric Aerosol and Gas Experiments (SAGE I, II, and III), and (since 1998) total ozone in the Global Ozone Monitoring Experiment (GOME). 26Lidar is essentially radar that uses lasers as sources of pulsed electromagnetic radiation. The Dobson unit is a measure of the total integrated concentration of ozone in a vertical column extending through the atmosphere. It is the pressure in milliatmospheres (matm: 1 matm = 10~3 atm) that all the ozone in this column would have if it were compressed to one centimeter height. Thus, for 300 DU, the pressure of ozone in the hypothetical 1-cm column would be 300matm. Assume now that the height of the column is increased to 30 km (3 x 106 cm) altitude greater than 5%; these are due to seasonal variations (as much as 4% difference between a May-September maximum and a December minimum) and natural meteorological phenomena that include the tropical Quasi-biennial Oscillation (an approximately 26- to 27-month oscillation or cycle between easterly and westerly winds in the lower equatorial stratosphere), 11-year solar sunspot cycles and fluctuations, and the El Nino-Southern Oscillation of about 4 years (Section 3.3.1). Nevertheless, when the measurements over the 30-year period from 1964 to 1994 are treated and smoothed with a statistical model to filter out these natural components, they still show an overall global decline of approximately 4% in total ozone during the 13 years between 1978 and 1992, with however the change near the equator close to zero (Figure 5-8). About 64% of this total global change appears in the Southern Hemisphere. In 1992, beginning in May, the global total ozone concentration dropped about 1.5% lower than expected from a linear extrapolation of the rate just given. In December 1992, the ozone levels in the northern midlatitudes over the United States were about 9% below normal, dropping to about 13% below normal in January and continuing well below normal into July, 1993, getting to as low as 18% lower at some sites. Similar record low stratospheric ozone levels were also observed over Canada and eastern and southern Europe, extending through August, 1993. Smaller unexpected midlatitude decreases appeared in the Southern Hemisphere. These extraordinary and unprecedented effects are believed to have resulted from the June 1991 eruption of Mount Pinatubo, which increased the stratospheric sulfate aerosol layer. However, volcanic aerosols had essentially disappeared by mid-1993, and in fact the annual decrease in total ozone had returned in 1994 to the pre-1991 values. This is as predicted, as the stratosphere recovered from volcanic debris. FIGURE 5-8 Percent change in total ozone relative to the 1964-1970 annual average for the Northern Hemisphere (35°N-90°N), the Tropics (35°N-35°S), and the Southern Hemisphere (35°S-90°S). The Mount Pinatubo eruption occurred in June, 1991. Drawn from data of K. Tourpali, X. X. Tie, C. S. Zerofos, and G. Brasseur, J. Geophys. Res., 102, 23,955-23,962 (1997). The foregoing trends in global stratospheric ozone, although statistically significant, are admittedly small and obscured to a large extent by the seasonal variations that have been fairly regular for over 30 years. In striking contrast to this global behavior is the large depletion in total ozone above the Antarctic pole, first reported in 1985.28 This depletion, called the Antarctic ozone hole, occurs in the Antarctic spring beginning in September and reaching a maximum (i.e., minimum total ozone) generally in early October. It disappears in November and early December as shifting springtime winds transport ozone-rich air from the middle and lower southern latitudes into the hole. 28J. 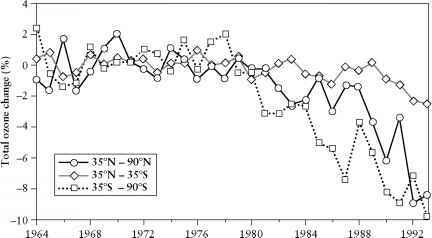 C. Farman, B. G. Gardner, and J. D. Shanklin, Large losses of total ozone in Antarctica reveal seasonal ClO^/NO* interaction, Nature, 315, 207-210 (1985). 98 DU during October of the 1994 and 1995 Antarctic winters, respective'y; a low of 95 DU was observed for the 2000 Antarctic winter, occurring on October 1, 2000. Most of the change occurs in the 'ower stratosphere between about 10 and 24 km, a zone in which the ozone concentration has reached essentia''y zero during the October minimum since the record 'ow year of 1993. The area covered by the ho'e has a'so continued to increase since first observed in 1985; in 2000 it covered an area greater than 28 x 106 km2, about the size of the North American continent and twice the size of Europe, extending to the tip of South America. Furthermore, after the ho'e breaks up, ozone-poor air drifts northward, resu'ting in increased u'travio'et radiation beyond Antarctica. It is now accepted that the po'ar vortex, which is the strong cyc'onic "whir'poo''' with winds upwards of 100 m/s circ'ing the po'e, virtua''y iso'at-ing the gases within it from the midd'e 'atitudes, and the extreme'y co'd Antarctic night are the distinguishing factors that 'ead to the formation of the 'arge zone of temporary ozone dep'etion. Temperatures in the swir'ing vortex can reach 'ower than —86°C (187K), which is the temperature at which ice partic'es can form, producing c'ouds even in very dry stratospheric air (probab'y on su'fate aeroso's) at a'titudes between 10 and 25 km. These c'ouds of ice crysta's are ca''ed type II polar stratospheric clouds, or type II PSCs. In addition to these type II PSCs, however, c'ouds a'so form at higher temperatures—as high as —80°C (193 K). These are ca''ed type I PSCs.29 Various possibi'ities have been suggested for the composition and phase or phases making up the type I c'ouds. These inc'ude crysta's of nitric acid and water (particu'ar'y NAT, the nitric acid trihydrate HNOy3H2O) nuc'eated by frozen su'fate aeroso's (su'furic acid tetrahydrate, or SAT); ternary supercoo'ed 'iquid so'ution drop'ets of water, nitric acid, and su'furic acid; binary so'utions of nitric acid and water; and a metastab'e water-rich nitric acid so'id phase, as we'' as various combinations of these. The specific composition of type I PSCs may in fact be quite sensitive to the temperature and to the occurrence of freezing-thawing cyc'es during c'oud formation. Most of the Antarctic ozone dep'etion occurs be'ow 20 km. In this region there are virtua''y no oxygen atoms present for two reasons. First, the re'ative'y high third-body pressure maximizes the pressure-dependent O + O2 recombination, reaction (5-29); and second, the 'ack of sun'ight during the Antarctic night minimizes the O-atom-producing photodissociation of O3, reaction (5-30). As a resu't, neither mechanism (5-45) nor (5-46) can be occurring to any significant extent. Neverthe'ess, observations c'ear'y show that stratospheric ch'orine species are invo'ved in this dramatic ozone 'oss. The PSCs thus appear to be essentia' in formation of the Antarctic ho'e. 29Type I PSCs are sometimes further broken down into types Ia and Ib. This mechanism can also be bromine-enhanced by mechanism (5-55). Other "storage'' molecules are HOCl and ClNO2; they are produced by heterogeneous reactions like (5-58) and are also photolyzed in the Antarctic spring into Cl atoms, thereby further contributing to ozone destruction via (5-60). We see, then, that PSCs not only lead to the containment of "storage" molecules and the eventual release (in early spring) of "active" molecules that catalytically destroy ozone; they also can lead to release of species, such as NO2, that destroy "active" molecules and thus prevent extensive ozone destruction. It turns out that when the temperatures remain low enough (i.e., below the condensation temperatures of the PSC phases present) long enough, the particles making up the PSCs grow and sedimentation occurs. This leads to permanent removal of HNO3 by transport to lower elevations, so that continued destruction of ozone occurs as a result of sustained high ClO. concentration. This process is called denitrification; it commences in the Antarctic during June and continues through the Antarctic winter and early spring. the effect of reaction (5-62) is to tie up NO2 so that less of the "inactive" chlorine nitrate is formed by reaction (5-56), leaving more "active" ClO. available for the ozone-destroying cycles. The stratospheric sulfate aerosol layer during the Antarctic spring is below 20 km and has a broad maximum between 10 and 16 km. It is now believed that this sulfate layer was responsible for the 1993 record low Antarctic ozone hole. The slight moderations in the minimum depletions of 1994 and 1995 may be due to disappearance of aerosol from the Mount Pinatubo eruption after 1993, although the 1996 hole appeared earlier than usual (maximum ozone depletion on October 5) and was as intense as during the preceding several years. Direct observations of stratospheric C'O. by aircraft flying within the po'ar vortex conc'usive'y show the invo'vement of CFCs and ha'ons in the Antarctic ozone dep'etion process. For examp'e, before the onset of the Antarctic spring and the deve'opment of the ho'e, the concentration of C'O. within the vortex from about 65°S has been more than 100 times greater than outside the vortex at 'ower 'atitudes. When the ho'e has fu''y deve'oped in 'ate September and ear'y October, there is comp'ete corre'ation between the ozone dep'etion and C'O. enhancement as a function of 'atitude and a'titude within the vortex. Warming toward the end of winter often occurs in February (equiva'ent to August in Antarctica) before there is enough sun'ight to re'ease active C' and C'O.. The po'ar vortex usua''y is more distorted and breaks up by the end of March. In addition, during 'ate winter and spring, ozone-rich air from the 'ow 'ati-tudes above the equator is regu'ar'y transported northward at high a'titudes to the North Po'e region.30 This "physica''' ozone increase wi'' tend to obscure any chemica''y induced dep'etion of ozone. 30For examp'e, this 'ed, prior to 1988, to tota' 'ate-spring ozone co'umn concentrations greater than 450DU above 70°N 'atitude—much above the year-round g'oba' average of about 306 DU. Pole, into late April, isolating the polar region from the inward flow of ozonerich air. Anomalous low temperatures—below that needed for type I PSC formation—continued through most of March. Concurrent high stratospheric concentrations of ClO. (as high as those in the Antarctic spring) in February indicated chemical ozone loss consistent with the halogen-catalyzed ozone depletion mechanism (5-60). The average Arctic ozone column concentration for the month of March (354 DU) was approximately 21% lower than pre-1988 values and reached a record low of 219 DU on March 26, 1997. The Arctic winters of 1997-1998 and 1998-1999 were relatively warm, with low loss of ozone. However, the 1999-2000 Arctic winter was one of the coldest on record, with a low of —89°C on January 10 and temperatures below that needed for type I PSC formation (—80°C) continuing over a longer period (from about November 20 to March 10) and a larger area than in any previously observed winter. Atmospheric measurements made from November, 1999 to April, 2000 showed greater ozone depletion in early February (approximately 1% a day) than in the cold 1995-1996 winter, leading to a clear ozone minimum over the Arctic pole that extended during February and March over an area comparable to a typical Antarctic hole. About 70% of the ozone near 19 km above the Arctic was depleted by the end of March. In addition, studies of oxides of nitrogen loss in the polar vortex from mid-January to mid-March, 2000 (well after the breakup of the PSCs), showed the most severe Arctic denitrification ever observed. In contrast, during the 2000-2001 Arctic winter a strong polar vortex formed in October and November, but mild stratospheric warming occurred after that with temperatures rising above the PSC-forming threshold by mid-February. This resulted in a heavy disturbance of the vortex and only a moderate total ozone loss for the season of approximately 20%. Almost from the very beginning of the concern over potential stratospheric ozone depletion by nitrogen oxide or atomic chlorine from chlorofluorocar-bons there have been repeated calls—mainly by the scientific community—for reduction and eventual elimination of the industrial uses of CFCs. In 1978, almost all uses of CFCs for aerosols (primarily CFC-11) were banned in the United States. However, it was not until it was unequivocally shown by the Antarctic ozone hole that ozone could actually be destroyed in the stratosphere by human releases of chemicals into the troposphere that very strong action was officially taken by governments: the Montreal Protocol on Substances That Deplete the Ozone Layer, signed in 1988 and amended several times since then. By January 1, 2001, 175 countries had signed this agreement, which banned production of all halons (the major fire-suppressant chemicals) as of January 1, 1994, and all CFCs, methyl chloroform (CH3CCl3), and carbon tetrachloride by January 1, 1996, for developed countries. The protocol has a 14-year grace period for developing countries (including production of small amounts by industrialized countries for use by developing countries), and also contains provisions allowing countries to petition for some exemptions based on lack of feasible chemical replacements, but it appears that relatively few such exemptions will be allowed. By 1993, the electronics industry in the United States had already almost completely stopped using CFCs (CFC-113) and methyl chloroform for precision cleaning, opting either for completely eliminating cleaning, or for cleaning with aqueous solutions. The United States capped consumption of methyl bromide (which accounts for about 10% of the ozone destruction) at 1991 levels in 1995, and a gradual phaseout started in 1999 with total consumption ban scheduled for 2005, in line with the 1997 amendments to the Montreal Protocol. The Japanese electronics industry phased out CFC use by 1995. There is some concern, however, about the possibilities for noncompliance with the provisions of the amended Montreal Protocol and with illegal trade of CFCs among developed and developing countries. Many of the compounds being developed and used for replacement of the CFCs are the hydrochlorofluorocarbons, HCFCs, in which some of the CFC chlorine atoms have been replaced with hydrogen atoms that are readily abstracted by .OH radicals in the troposphere.31 As we saw Table 5-1, this greatly reduces their ozone depletion potentials, or ODPs.32 For example, HCFC-141b (CH3CFCl2—see Table 3-2, note a, for determining compositions of CFCs, HCFCs, and HFCs from their names) has almost completely replaced CFC-11 as a blowing agent in the manufacture of polyisocyanurate foam insulation, and HCFC-124 (CHClFCF3) is an alternative for medical applications. However, since the HCFCs still contain one or more chlorine atoms, they still possess finite ODPs (see Table 5-1). As a result, the HCFCs also had production caps imposed by 1996 and phaseout of HCFC-141b in the United States and Europe by 2003 has been mandated. 31J. S. Francisco and M. M. Maricq, Atmospheric photochemistry of alternative hydrocarbons, in Advances in Photochemistry, vol. 20, D. C. Neckers, D. H. Volman, and G. von Bilnau, eds., pp. 79-163. Wiley, New York, 1995. 32The -CF3 radical, a fragment of HCFC-destroying reactions, is itself very stable and therefore potentially could also be involved in ozone-depleting catalytic cycles via CF3O' and/or CF3OO' radicals. However, laboratory studies and atmospheric models have shown that this is not the case—see Section 8.6.2.2. (CHClF2), also a substitute for CFC-12, was widely used as a stationary air conditioner refrigerant, but it is being replaced by mixtures of various HFCs. Other compounds without chlorine that are being developed for CFC replacements are the fluorinated ethers, HFEs. For example, HFE-7100 (C4F9OCH3)33 and HFE-7200 (C4F9OC2H5)34 are now being used commercially for applications employing liquids such as cleaning electronic equipment, secondary refrigerants, and carrier fluids for lubricants. HFE-7100 and HFE-7200 are trade names for isomeric mixtures of the materials; for example, HFE-7100 is a mixture of 40% of the normal isomer n-C4F9OCH3, CF3CF2CF2CF2OCH3, and 60% of the iso isomer i-C4F9OCH3, (CF3)2CFCF2OCH3. They are readily oxidized in the troposphere by .OH radicals, giving short atmospheric lifetimes. The lifetime of 4.1 years given in Table 5-1 for HFE-7100 is a weighted average of 4.7 years for the normal isomer and 3.7 years for the iso isomer. Similarly, HFE-7200 has a lifetime of 0.8 years. Like the HFCs, they have zero ODPs. The ideal replacement chemicals might seem to be the fully fluorinated perfluorocarbons (PFCs), since they are nontoxic and nonflammable, and have zero ODPs. Since, however, they are very unreactive, with no known atmospheric sinks below the mesosphere, they have extremely long atmospheric lifetimes—greater than 50,000 years for CF4 (Table 5-1) and 10,000 years for C2F6. Since in general they absorb radiation in the near-infrared "window," they are very powerful greenhouse gases (see Sections 3.1.2 and 3.3.3). It is estimated, for example, that the impact of the PFCs on global warming may be greater than 5000 times than that of carbon dioxide 100 years after their release into the atmosphere. CFCs and HCFCs are also powerful greenhouse gases (i.e., large global warming potentials: see Table 3-2), although their atmospheric lifetimes (Table 5-1) are much less than those of the PFCs. Some HFCs such as HFC-23, a by-product in the production of HCFC-22, are also greenhouse gases. On the other hand, iodofluorocarbon compounds absorb strongly in the near-UV spectral region, leading to photodissociation (the C—I bond is weaker than the C—Br or C—Cl bond). Thus they have atmospheric lifetimes of only a few days and therefore have essentially zero ODPs and are not greenhouse gases. Trifluoromethyl iodide (CF3I), which has an atmospheric lifetime of less than 2 days, is a promising replacement for H-1301 (CF3Br) for controlling fires, but its toxicity makes it unsuitable for use in enclosed spaces. 33T. J. Wallington et al., Atmospheric chemistry of HFE-7100 (C4F9OCH3): Reaction with .OH radicals, UV spectra and kinetic data for C4F9OCH2. and C4F9OCH2O2. radicals, and the atmospheric fate of C4F9OCH2O- radicals, J. Phys. Chem. A, 101, 8264-8274 (1997). 34L. K. Christensen et al., Atmospheric chemistry of HFE-7200 (C4F9OC2H5): Reaction with .OH radicals and fate of C4F9OCH2O( ) and C4F9OCHO( )CH3 radicals, J. Phys. Chem. A, 102, 4839-4845 (1998).